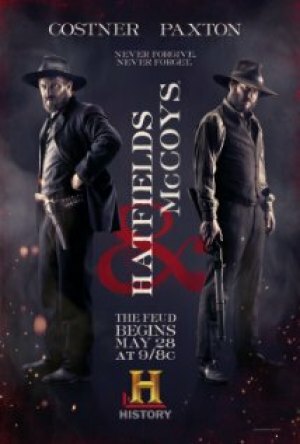 The hills are alive with the sound of feuding -- but the hills are in Romania -- not Kentucky and West Virginia "Hatfields & McCoys", a three-part, six-hour mini-series about the famous feud broadcasts beginning Monday evening, May 28 (9 p.m., 8 central time) on History Channel. (http://www.imdb.com/title/tt1985443/) shows that many of the feuding West Virginians and Kentuckians are played by Romanian actors and actresses. Apparently It was less expensive to film in Romania than in West Virginia and Kentucky. "I think we all would have preferred to be close to home, and on the Appalachian mountains, but we weren't." In the same story, Paxton said he took a side trip to Kentucky on the way to work in Eastern Europe. "I thought, 'Gee, if I'm going over to Romania to shoot this thing, I better go take a look to see what it looks like for real.' And I was kind of amazed there were so many similarities." The hills made the region somewhat claustrophobic, leading Paxton to observe: "You can see how that part geographically was just so isolated so long. And how something like a feud like this could go on for a long time." "In researching the story, I guess I gathered as much as I possibly could, so I didn't come to it thinking it was a fairy tale," Costner said in the advance story on the series, referenced above: "I knew it was a real story with real participants, set against an era, a time, coming out of the Civil War, so I knew how deep the feelings were running just over that war." And yet, Costner continues, the offspring of the feuding heads of family "didn't know what the Civil War was about, and they didn't know what some of these old scars were about, and a combination of drinking and unemployment and all this stuff just led to these kind of murders, and then, of course, the patriarchs had to stand up." Costner says he sees Hatfield as an honorable man, an entrepreneur who hired McCoys in his lumberyard. For his part, Paxton says, he had a hard time relating to McCoy. "But my job's not to relate to him, but to try to give conviction of character." "There has certainly been revenge killing happening in this century. Based on what's happening in Libya and Serbia-Croatia and Afghanistan and Iraq, there's going to be honor killings for the next 50 to 60 years there," Costner says. "So what's really changed?"